Astronomers recently discovered an exoplanet that is the size of 11 Jupiters. The massive alien planet orbits star HD 106906, and is farther away from the star than any other planet in a sun-like system. Led by a University of Arizona graduate student, the team that first spotted the giant says its mass is one one-hundredth the mass of the sun. It is 650 times farther from its host star than the Earth is from our sun. The surface temperature is about 2,732 degrees Fahrenheit – several hundred degrees hotter than Earth’s core. The discovery is puzzling astronomers, because they have never seen such a large planet so far from its host star. In our own planetary system, Neptune and Uranus are the farthest large planets. Their orbits are 15-30 times larger than Earth’s orbit. An orbit 650 times larger, for a planet that is so huge, will force a re-thinking of the current understanding of planetary formation. "This system is especially fascinating because no model of either planet or star formation fully explains what we see," Vanessa Bailey, the fifth-year graduate student who led the study, said in a statement. Several theories have been proposed to explain the formation, but they’ve just as quickly been ruled out. Could it have formed in another system, around a different star, before an unknown event sent it to this system? No, because at less than 13 million years old, it’s too young to have formed, broken away, and joined another system. Another theory is that it is a binary system -- a failed second host star. "A binary star system can be formed when two adjacent clumps of gas collapse more or less independently to form stars, and these stars are close enough to each other to exert a mutual gravitation attraction and bind them together in an orbit," Bailey explained. "It is possible that in the case of the HD 106906 system the star and planet collapsed independently from clumps of gas, but for some reason the planet's progenitor clump was starved for material and never grew large enough to ignite and become a star." 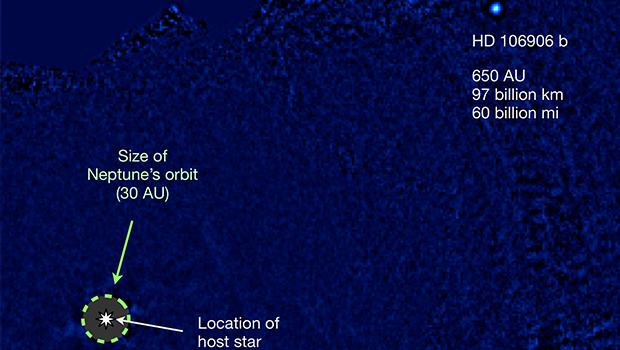 Even with this evidence, the theory is unlikely because the newly discovered planet, dubbed HD 106906 b, isn’t big enough. Binary formations are usually within a 10:1 ratio of the mass of the host star. "In our case, the mass ratio is more than 100-to-1," she explained. "This extreme mass ratio is not predicted from binary star formation theories – just like planet formation theory predicts that we cannot form planets so far from the host star." The team discovered the planet using the Magellan Adaptive Optics (MagAO) system and a Clio2 thermal infrared camera mounted on the Magellan telescope in Chile. “Every new directly detected planet pushes our understanding of how and where planets can form," said co-investigator Tiffany Meshkat, a graduate student at Leiden Observatory in the Netherlands.